Stainless steel (SS) wafers, foils and substrates are now available from Valley Design. 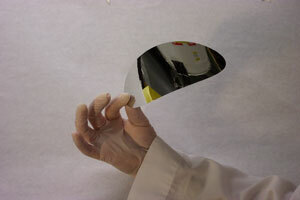 Lapped or optically polished surfaces can be provided as well as thin stainless steel wafers as thin as 25um (.001"). Wafers and substrates can be processed from common stainless steels such as 304, 316 and 430 in diameters up to 300mm and larger. Commonly available SS wafer diameters to SEMI specifications include 1", 2", 3", 100mm, 125mm, 150mm, 200mm and 300mm. Other readily available SS substrate sizes include 1" sq., 2" sq., 3" sq., 4" sq., 4.5"sq., 6" sq., and 12" sq. Typical polished wafer thicknesses include 125um (.005"), 250um (.010"), 375um (.015"), 500um (.020"), 625um (.025") and 1mm (.040"). In smaller geometries, parts are available in thicknesses as thin as 25um (.001"), and thinner in some instances. Thinner polished SS foils can be used as extremely flexible substrates. On critical stainless steel optics, polished surface finishes to less than 10 Angstroms are achievable. Stainless Steel 300 Series, has excellent thermal shock resistance and mechanical robustness. Operating temperatures range from -270° to +400°C. Please call or e-mail for more details, or for a quotation per your specifications.